If you’re a regular follower of this blog, you’ll notice that alongside social media, I’m now also regularly writing about elearning. 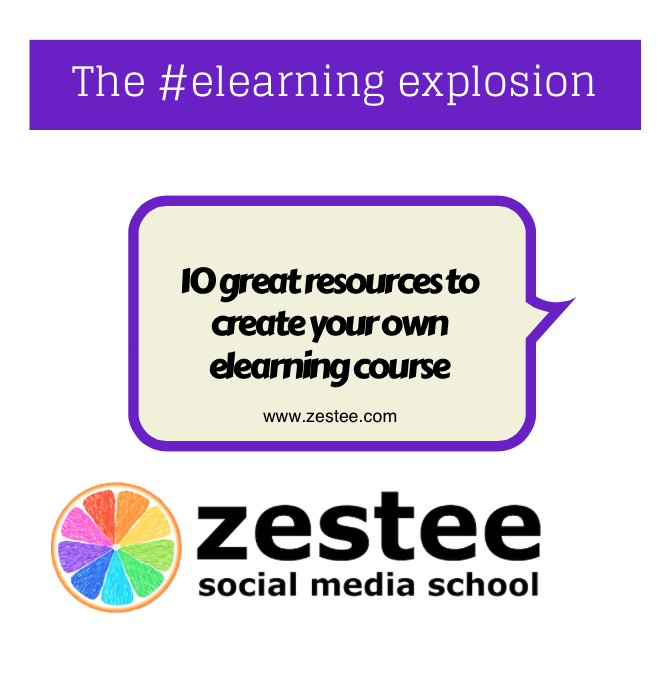 In this post I am gathering a number of resources to create your own elearning course. My interest in this came from learning more about this topic so I could create an online version of the social media workshops I started running around 5 years ago. This lead to the Zestee Social Media School being offered online for the last 3 years. In that time, elearning resources and tools have come ahead in leaps and bounds. There are two sides to this elearning explosion, one is as a student and the other is a teacher. The most recent series of posts I’m sharing is focussed on those who would like to teach online. Is it eLearning, elearning or Elearning? Beyond all this information and resources I’m building myself on this blog, there are many other awesome posts and websites out there. So here are 10 resources to create your own elearning course that I’ve reviewed and think are worth checking out. This list is all about the actual process, strategy, design and development of your own elearning course and is mainly for individuals or small business. In other words, WHY would you create an ecourse, WHAT kind of things should you consider first and HOW can you make this effective. I will write another post about the specific elearning tools and platforms soon. Each of the websites included in that list have a treasure trove of elearning and ecourse articles and of course a Google search on any of these topics or keywords brings up hundreds of thousands more. This can be overwhelming, but as I have written before in my Frenzy, Fatigue, Focus theory on social media and life blog post, I’d recommend just picking one or two and getting started! So if you’d like to create your own elearning course, after reading even just a couple of these, you are well on the way to get started. Have you found a great online resource about how or why to create your elearning course to add to this list? Please comment below!